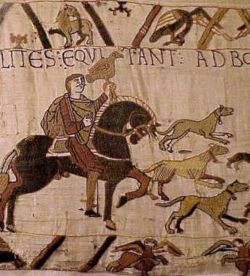 King Harold out for a hunt on the Bayeux Tapestry, no doubt a song was sung soon after. Image found at http://regia.org/research/misc/pastimes.htm. The poet’s song turns from Sigemund and his glorious victory to look instead at a man defeated: Heremod. Although there’s no poet interjecting here to keep things from getting messy, this passage is dangerous. Earlier, before this poet on horseback started to sing of Sigemunde, there was some noise made about everyone praising Beowulf, but being happy with Hrothgar as their king. In fact, the poet goes so far as to give Hrothgar one of the highest epithets: “that was a good king!” (“þæt wæs god cyning” (l.863)). In light of this passage, though, there could be some sarcasm in that earlier statement. Here we’re told how Sigemund’s fame grew after he beat the dragon and stole away its treasure, bringing it to his own people. In fact, it even sounds like Sigemund had some sort of happy homecoming because of his courageous deed. In fact, it sounds like he might have been in that far country where the poet alleged his story of the hero came from because of some sort of exile. And, what’s more, possibly exile at the hands of king Heremod. After the first three lines, the poet shifts over to this figure of lore. Heremod is king of the Danes, and when we meet him here he is the very picture of melancholy. Having suffered a great loss when fighting the Jutes (maybe the giants? the word used is “eotena” which could mean either), Heremod falls into a depression and loses his warlike demeanour. He must’ve been some battler since his entire court is thrown into disarray when he no longer steps out to campaign or bring in treasure from raids. As a reader of Anglo-Saxon culture as much as Anglo-Saxon poetry, this passage — the poet’s song on horseback in general — is supposed to show the two examples of great man that stand before Beowulf — the man triumphant in Sigemund and the leader who is shackled by shame and fear in Heremod. Later on, Hrothgar talks more explicitly about Heremod as a bad king (the kind Beowulf should not be), but right now this whole thing being an example for Beowulf is just implied. But it’s really hard to not see it as a subversion of the poet’s saying “the people thought Beowulf was great! But, oh yeah, they still like Hrothgar, too.” I mean, you’ve got the young hero Sigemund who’s just reversed his fortunes by defeating the dragon and winning the treasure and that’s pretty much Beowulf. Sure, our hero hasn’t fought a dragon yet, but he’s beaten Grendel and won great fame that’s quickly spread thanks to the treasure that Grendel left: his arm and claw. Then you’ve got Heremod, the man who sits in his court and bemoans his defeat. Isn’t that too much like the Hrothgar of the last 12 years for any sort of analogy or parallel to be made? So I think this passage is the poet insinuating that Beowulf could become the new ruler of the Danes. But we can’t know for sure until we get the rest of the story in the next part of the poem. How subversive do you think the poem Beowulf is? Is it just some light entertainment? Or is it about the young overtaking the old? Or is Beowulf a Christianized Germanic hero bringing new vibrancy to an old tradition? Maybe it’s because sorrow and pitched battle are involved in this passage, but compound words are coming back! Actually, it wouldn’t surprise me if their reappearance was due more to the depression and sorrow of Heremod. If Anglo-Saxon poets wove their words into tangles to accurately represent war, then surely they could do the same to represent the complexities of the deep sadness the old king’s experiencing. But, of course, there are some very interesting nuances to both of these words. With “wer” we get a look into the Anglo-Saxon idea of the value of life in that the word can mean the “legal money-equivalent of a person’s life,” or “a man’s legal value.” Of course, it has to be noted that a monetary value was attached to human life in Anglo-Saxon society because of law makers’ attempts to control rampant feuding. So, if you happened to kill someone from that group over there, they wouldn’t have to come and kill you, you could just pay that group the value of the life you took and the feud would be called off (legally, anyway). This bunch of laws is an unfortunate imposition since it might’ve been used to turned a few lives into bits of silver, but still. This concept helped to keep people from endlessly feuding so they could do other things. Plus, I bet these laws had some repercussions on ideas of manliness that have resonated down through the centuries, too. The other half of this compound similarly has some neat meanings. Like “Gentiles” or “language.” In combination with the former, the compound could mean the collection of those who weren’t Jewish, those who weren’t chosen by God. In light of the Anglo-Saxons trying to identify with the Jews of Exodus, a people in search of a homeland, referring to the Danes as Gentiles even through vague implication is interesting. And as a story about pre-Christian times, this meaning seems unlikely to be a coincidence. At the least, I can see the poet smiling after the fact and considering himself very clever indeed for using “wer-þeod where he has. But combining “wer” with the “language” sense of “þeod” is where things really pick up. The sense of such a combination is that all of those who speak the same language are one group. That’s a really cool idea! But I digress, since there’re other compounds to get to. Like the less mysterious “sorh-wylmas.” This combination of “sorg” (“sorrow,” “pain,” “grief,” “trouble,” “care,” “distress,” or “anxiety”) and “wielm” (“boiling,” “swelling,” “surge,” “billow,” “current,” “stream,” “burning,” “flame,” “inflammation,” “fervour,” “ardour,” or “zeal”) means “wave of sorrow.” And its constituent parts don’t really make that meaning a secret. Though I suppose there’s a bit more colour to the idea of a wave of sorrow if you add in the sense of that wave being arduous or zealous. It’s not just a lazy lolling mass of sadness washing over you, but the sort of wave a ship in the middle of the sea might encounter while in a storm’s clutches. Then, rounding out the bunch but being strangest of the three is “aldor-cearu” of line 906. Meaning “great sorrow,” this one combines “ealdor” (“elder,” “parent,” “ancestors,” “civil or religious authority,” “chief,” “leader,” “master,” “lord,” “prince,” “king,” “source,” “primitive,” “life,” “vital part,” “age,” “old age,” or “eternity”) with “cearu” (a form of “carig” carrying meanings like “sorrowful,” “anxious,” or “grievous”). “Cearu” is pretty straightforward. But “ealdor” much less so. This one could combine with the former to mean a few shades of “great sorrow.” It could be old sorrow, implying that it’s the sort of sorrow that’s sat and festered for years; it could mean that it is a princely sorrow, a sorrow that comes with the responsibility of ruling over a people; or it could be seen as the sorrow that simply comes with age, the regret and feelings of inadequacy a person experiences as they inevitably compare their present selves to their younger, remembered as happier and stronger, selves. It’s definitely a worthy companion to the much simpler “sorh-wylmas,” though, since both carry a heavy weight with them. If you agree that the language of the poem is intentionally more complex around descriptions of battles and of sorrow, what do you make of it? Is treating sorrow as the same sort of complex ordered mess as a battle accurate, or just a weak comparison? What do you think of all of this if you don’t agree that the language’s complexity is intentional? In the next post, the story of Heremod wraps up. Beowulf fighting the dragon. There are striking similarities between this fight and Sigemund’s. 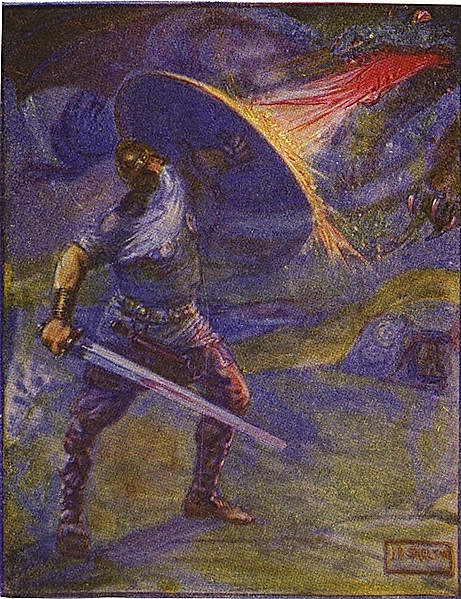 Image found at https://upload.wikimedia.org/wikipedia/commons/6/6f/Beowulf_and_the_dragon.jpg. The poet in the poem sings of Sigemund defeating the dragon alone and winning its treasures. that lordly iron; the dragon died its death. We’ve got another simple, straightforward type passage here. Though it begs an important question: what’s the story of Sigemund doing here? It’s something that the poet on horseback has conjured up out of his knowledge of the hero, and there are definitely analogues to Beowulf. Though these analogues are really only present if you’re already familiar with Beowulf. Otherwise, all of the talk of Sigemund fighting the dragon and winning is just foreshadowing. Weirdly, though, the exact phrase “under the grey stone” (“under harne stan” (l.887)) comes up when Beowulf faces the dragon in the last third of Beowulf. Anyway, I think what’s going on here with the analogues to Beowulf — his slaying a dragon, driving the sword through a dragon who guarded a bunch of treasure,and the dragon being liquid in some way — is a bit of play with the nature of myth and legend. It’s also interesting that when the ring hoard of the dragon comes into Sigemund’s possession it’s not a cause for celebration because he has the treasure for himself. Instead, it’s a great event because Sigemund’s able to spread the wealth among his closest relations. Beowulf also celebrates the gain of the treasure not as a personal victory but as one for his people. How much do you think is going on with this story of Sigemund? Is it here because the poet’s trying to say something about heroes? Or just something sung while the people of Heorot rejoice? I’m starting to wonder if the language of the poem is getting simpler as this other poet sings because of how the actual poet wants this in-tale poet to look. If the actual poet of Beowulf is trying to put his all into it, then there can’t be a poet in the story who’s use of language is more complex or descriptive, right? Anyway, the simplicity of the language throughout this section means that there aren’t many compound words. And generally when there are, they’re pretty simple. The word “beah-hordes” meaning “ring hoard” is the only compound of note in the passage for this entry. It’s a combination of the word “beah” (meaning “ring,” “coil,” “bracelet,” “collar,” “crown,” or “garland”) and “hord” (meaning “hoard,” or “treasure”). And that’s really all there is to it. Combining these two words really does nothing more than specify the kinds of rings that you’re dealing with. Not much more fantastical stuff beyond that, really. But, there are two words in the passage for this entry that do offer a little more. Even if they’re perfectly normal, singular words. What makes “dōm” stand out is that in the context of the passage it means “glory” or “reputation,” meanings that are kind of a ways down the list. But even so, it’s not an interesting word because its in-context meaning is low on its list of meanings. The word itself seems to really express what underpins reputation, and therefore fame, in a very neutral way. Judgement underlies fame, after all. And, weirdly, in Modern English the connotations have shifted, since to us “fame” generally seems like a good thing while “judgement” feels like it’s the face of a beast called guilt. Maybe there’s something to say here about the perceptions of judgement and the cultural influence of Christianity, a religion promising judgement with eternal consequences. But in Old English, the sense of “dōm” meaning judgement and its forms and offshoots is much more neutral. Simply put, you need to be judged to have a reputation or fame, so “dōm” covers a lot of this area of meaning. Maybe because it also seems to be a general sort of word. It’s used as it is here to mean” reputation or “fame” and it’s used elsewhere to refer to divine judgement and elsewhere still to refer to the day the world ends in judgement (so I guess its appearances in Old English are soaked in Christianity, too). But maybe more than anything it all just comes from the Old English “dōm” being narrowly cognate with our own “doom,” a much much more streamlined term for having been judged and found wanting, or for hopeless consequences. The other weird word in this passage is much lighter. In line 887, the poet describes the dragon as the “hierde” of his hoard of treasure. The use for the sake of alliteration here is supremely obvious, but I still find it neat that the word for “shepherd,” “herdsman,” “guardian,” “keeper,” or “pastor” could be stretched in this way. A “guardian” makes sense in reference to gold, as does a “keeper.” But what about the sense of guidance in “shepherd,” “herdsman,” and “pastor”? How could you guide a hoard of treasure, especially if you weren’t sharing or spending it, but just sitting on it as dragons do? Maybe there’s a bit of foreshadowing in this sense of the word, or even a judgement passed on the dragon, since when Sigemund becomes master of the treasure he does much more to guide it into the hands of his people. There’s a Christ analogy here, too, with the dragon as Satan or a pre-Christian deity, while Sigemund, going it alone under the grey stone (itself perhaps a reference to Jesus going into the sealed tomb after the crucifixion, or even a reference to the harrowing of hell) is the Christ figure and the treasure is salvation, which Sigemund gives freely. Old English words have a lot of different shades of meaning to them. Do you think the same is still true with Modern English, or, as English has changed over the years its vocabulary has become specialized? In the next passage, we hear how Sigemund’s victory affected his home and old king Heremod’s court. King Harold out for a hunt on the Bayeux Tapestry. Image found at http://regia.org/research/misc/pastimes.htm. The singer begins to tell of Sigemund and deeds hitherto little heard about. In this passage the poem takes a break from Beowulf’s story to talk about a different hero: Sigemund (a.k.a. Sigmund). We’re not told much about this figure of mythic proportions yet, except that he travels with his nephew and has a darkened past. But is he trying to escape this past and the feuds and deeds it contains or is he just working with that as a feature of his story? The poet’s not at all clear about any of it. Actually, the poet seems to go pretty far to weave a curtain of mystery around Sigemund. And, to a lesser extent, Fitela. Or at least Fitela’s in there because the curtain’s just so damn big. So this curtain of mystery (it’s too heavy to be a veil, I think), is made up of a few things. First the poet says that “many [of these deeds are] not widely known,” (“ellen-dædum, uncuþes fela” (l.876)). That’s straight forward enough. Maybe these stories aren’t widely known because they’re the ones that were told in the far country where Sigemund wasn’t very well known himself. No doubt he went on to make a name for himself in this country, but maybe that name was a pseudonym (maybe “Sigemund” is that pseudonym – not the cleverest, but hey, the extra syllable causes some confusion to this day). Or, maybe the locals that passed these stories on had a different angle on Sigemund’s deeds than most other tales about them. Whatever the case, this layer of the mystery curtain isn’t too far from being translucent. But the next one is completely opaque. When the poet moves onto the feuds and deeds that Sigemund apparently had some part in, he says that these things were as little known in the places he travelled to as he himself was. So, if these stories are coming from these countries, any information about these feuds and deeds will likely be scanty. What’s more though,is that we’re told that Sigemund only shared details about any of these things with Fitela. Fitela is said to be Sigemund’s nephew (this checks out, the similarly named Sigmund travelled with his nephew/son (Norse mythology has some very racy bits), too). Fitela’s also said to be Sigemund’s companion in battle, maybe one who was so reliable that they always faced hardship together, or maybe one that just seemed to find Sigemund whenever he fell into difficulty. It’s hard to say. Whatever the reason for their partnering up, the fact that Sigemund only told these things to Fitela suggests that the only way the poet knows them well enough to sing about them is through Fitela. At some point, the nephew must’ve spilled it about his uncle. That is, if the poet is telling true stories or stories coming from a very close witness to these “deeds of courage” (“ellen-dædum” (l.876)). Because this part of the poem is scant on details, maybe this poet knows these little known stories of Sigemund because he heard them not from Fitela but from this far country’s people. If that’s the case, then how far has this poet himself gone? The question of how much the poet singing about Sigemund learned about his subject first hand is a tricky one. What do you think matters most in story telling – accurately relating facts, or action, intrigue, and suspense? The parts of this compound, “ellen” and “dædum,” literally mean “zeal,” “strength,” “courage,” “strife,” or “contention” and “deed,” or “action,” respectively. The combined meaning of “deeds of courage” isn’t far from clear. Though mixing the “contention” or “strife” sense of “ellen” with “deed” gets so clear that it upends the glorious/courageous implications of “ellen-dædum” by suggesting a pretty plain Jane sort of performance in war. Applying such a word to someone would mean that person just did a “strife deed,” which sounds like something that you just do by default in combat. The word “eal-fela” graces line 883, just about rounding out this section. And it might be the plainest compound of them all. Though it does demonstrate the intensifying formula of Old English (combine two like words, (including negatives)), since “eal” means “all,” “many,” or “much” and “fela” means “very,” or “much.” So “eal-fela” literally means “all much,” with the sense of something that’s all-encompassing. Or, as is the case in the poem, the sense of “mostly all” of the giants. No, this passage doesn’t really offer complexity in its compounds. It’s more about the simple word combinations. Now, maybe I’m piecing this one together wrong, but “nyd” could be a form of “neod” (meaning “desire,” “longing,” “zeal,” “earnestness,” “pleasure,” “delight”) or “nied” (meaning “need,” “necessity,” “compulsion,” “duty,” “errand,” “business,” “emergency,” “hardship,” “distress,” “difficulty,” “trouble,” “pain,” “force,” “violence,” “what is necessary,” “inevitableness,” “fetter” or just being the name of the rune for “n”). For the most part the difference between these two words is negligible. But, there are some exceptions. The word “neod” suggests a sort of leisurely need, as its meanings include “pleasure” and “delight,” while “nied” comes across as more business like as it can mean “errand,” or “duty” (or, even, “business”). But the compound that “nyd” is a part of doesn’t get any simpler in its second half. So is the companionship that “nyd-gestealla” describes one that’s structured on duty or on pleasure? Or is it one that’s putting those involved in a position of business or of pleasure? Or is it that it’s supposed to do both, the ambiguity coming in to add a sense of reciprocity to the relationship it’s describing? Do you think there’s a connection between the tone of sections of Beowulf and the intensity of the compound words found in them? So far, this part of the poem is very light-hearted and the compound words here have mostly been straightforward, almost relaxed. Is there a connection between the two? If so, what could using a word like “nyd-gestealla” mean for this part of the poem? Is it being used as a reminder of hard times or as something else? In the next passage, the poet begins to tell of Sigemund and Fitela’s victory over a dragon and the raid on its hoard. The warriors keep riding and racing, while stories of Beowulf are told. I’ve kind of cut things off in the middle ending this passage at the first half of line 874. But I did it with good reason. This next section of the poem is a pretty lengthy bit of storytelling. Weirdly, actually, this is the last time we hear any mention of Beowulf’s story for a while. But that’s not the case with this passage. The passage from line 864 to line 874 is all about the lead in to all that story telling. As such, there’s not much going on here as far as what’s described. But even the language here is pretty plain. In previous scenes, like Beowulf’s fight against Grendel, or even the events after the fight, the lines are heavy with words and tightly jammed together. The words themselves give the impression of a lot of quick, decisive action. But here the Old English and the English translation of it have a much lighter, open air sort of quality. Which makes sense, since this passage sees the group racing across a beach while somebody renowned for storytelling is spinning yarns, and all things are pretty cheerful. On the language side of things, all this leisure time leaves the poet’s sentences to repeat with variation. A lot of clauses in this section just wind down to their core meaning. Take for instance, the first three and a half lines. In the first of these lines we’re told about the men racing, then we’re told about the path they race on, and everything’s topped off with a generally positive comment about things being “best.” Ambiguity comes out to play again here, but in a much more light hearted way since the “it” on line 867 could be the path or the racing in general. Either way, what’s being thought “best” is pretty light stuff. Then we come to the description of the storyteller. Of whom there’s not much to say. Though the same narrowing device seen at the start of the passage is used again: we start with a description of the teller and then wind up with a very straightforward bit about how he tells his stories. Really, the only truly odd part of this passage is that directly after the final sentence, from the next passage onward, the poet tells of how this story teller recounts the deeds of Sigemund the dragon slayer and his partner Fitela. What I take from this is that Beowulf‘s original audience was already familiar with this other song of Beowulf, the storyteller is the poet’s self-insertion character, or to an Anglo-Saxon audience Beowulf was closely associated with Sigemund. That last possibility stands out from the rest for me. In my thinking, for an audience to associate two characters so closely, they’d need to be familiar with each character’s story. In the case of Beowulf and Sigemund, this familiarity would mean that the audience would already know that both characters slew dragons. Sure, Beowulf beating Grendel might be reminiscent of a Nordic hero defeating a dragon, but Beowulf’s actually doing the same much later on in the poem would make the association more concrete. Plus, I think throwing in a story about dragon slaying here is too on the nose for mere foreshadowing. There’s more to why this story is told than that, especially since there’s such a shocking switch from mentioning this new song about Beowulf’s deeds to a story about someone completely different. How does this the tone of this entry’s passage strike you? Does it feel more open and free roaming than those of past passages, or is it just more business as usual? Much as was the case in my last post, the words in this passage are pretty straightforward. In fact, from line 869 onwards, the poet stops using compounds completely. And, in keeping with last week’s post, the compounds that are used are pretty straightforward. We’ve got “heaðo-rōfe,” meaning “famed in war, brave” (a combo of “heaþo” (“war”) and “roofe” (“vigorous,” “strong,” “brave,” “noble,” “renowned,” “array,” or “number”)). You might pull something out of mixing “war” with a word that can mean “number,” but I think, in context, this combination means the same as joining “war” with “strong” or “renowned”; the person you’re talking about has been in many wars. And, since the Anglo-Saxons fought pitched battles rather than those based in trenches or with remote arsenals, to survive many wars suggests prowess or luck. And either of those qualities could make for a famed warrior. Then there’s “fold-weg.” As a combination of “fold” (“earth,” “ground,” “soil,” “terra firma,” “land,” “country,” “region,” or “world”) and “weg” (“way,” “direction,” “path,” “road,” “highway,” “journey,” or “course of action”), this word could be literally translated as “earthen path.” But, its general translation simplifies this to “path” or “road,” which I’m perfectly okay with. The final compound for this post’s passage is “eald-gesegena” (combining “eald” (“old”) and “gesegena” (a variant of “gesegen” meaning “sayings”)). The neat thing here is that the tradition (of story telling, or at least of lore) is referred to by the short hand “sayings.” Not only are these old stories that the storyteller’s familiar with, but they’re things that people often quote or relate to each other or to themselves. That sort of detail is cool because it not only works well as a short hand for tradition (what could be more traditional than things that may, at least to cynics, be clichés or tropes?) but also very lovingly conveys the down-to-earth nature of this tradition, a word which itself refers to things that are earthy and of foggy origin. Up until now we’ve seen a lot of compound words. Do you think the poet’s using fewer compound words in this passage is supposed to reflect a change in the poem’s tone? In the next entry, the singer sings a song of Sigemund.